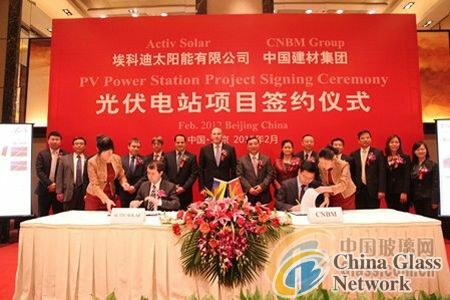 (China Glass Network) CNBM Group and Active Group signed agreement about EPC of 80 MW PV Power Station on Feb.13. Chairman of CNBM Group SONG Zhiping, Manager YAO Yan and Vice Manager HUANG Anzhong met with chief executive of Ukraine Active Solar Kevin etc. Active Solar is one of largest PV power station operating service companies in Ukraine, as well as an important customer of CNMB Import & Export Cooperation. 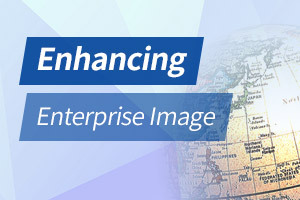 Active Solar and CNMB Import & Export Cooperation has cooperated more than two years. During the talk, SONG Zhiping introduced guests the development of CNMB Import & Export Cooperation, especially the achievements of cement and glass, as well as strength and development of new building materials, new houses, new energy materials. Kevin praised the achievements of CNMB, spoke highly of fruitful cooperation. And he said: “With strong scientific research strength, manufacturing advantage and powerful ability to integrate the resources, CNBM will get the world leading position in the PV filed as cement industry. Active Solar and CNMB made extensive communication and discussion about cooperation in Ukrainian PV and building materials market. Both sides agreed to deepen and explore new areas of cooperation on the basis of past experience. They will strengthen communication, investment and cooperation in many fields, including vertical integration of PV industry, the application of wind energy, other new energy and environmental housing. Moreover, they will give full play to their respective advantages and realize strong alliance to develop Ukraine and global market.